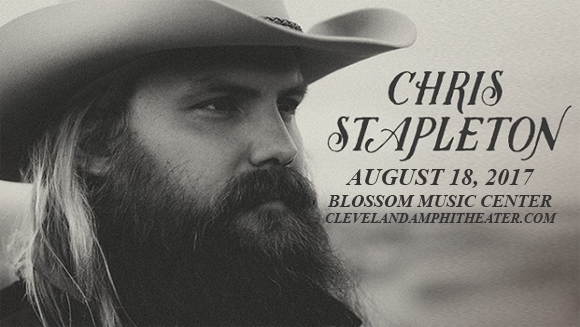 Acclaimed country music sensation Chris Stapleton will be heading to Blossom Music Center on Friday 18th August 2017 as part of his All-American Road Show! Promoting his new album, a follow-up to 2015's Grammy Award-winning smash hit Traveller, Stapleton will be joined by rising country stars Margo Price & Brent Cobbs! Don't miss this special night of All-American music at its best! Chris Stapleton is a country and bluegrass singer, who began his music career writing for artists such as: Adele, Luke Bryan, Tim McGraw, Brad Paisley, Darius Rucker, Kenny Chesney, George Strait and Dierks Bentley. After making his name as the frontman of Grammy Award-nominated bluegrass band The SteelDrivers from 2008-2010, Stapleton signed to Mercury Nashville in 2013, Stapleton's debut album, Traveller, was released in May 2015, becoming an instant hit, and earning him several awards and nominations, including three awards at the 2015 CMA Awards: "Album of the Year", "Male Vocalist of the Year", and "New Artist of the Year", as well as the CMT Artist of the Year Breakout Award. He also received four Grammy Award nominations for the 2016 ceremony, including Album of the Year, winning two: Best Country Album and Best Country Solo Performance.